Primitive primate. There are approximately 36 lemur species native to the island of Madagascar, including the Coquerel’s sifaka. These stunning primates differ from other lemur species by their dramatic mode of locomotion: sitting upright, they spring through the trees using the strength of their back legs. This is called vertical clinging and leaping and it is a sight to behold! The name sifaka, a Malagasy word, comes from its distinct call as it travels through the treetops: “shi-fakh.” Female sifakas are dominant over males and get first dibs on food and mates. Eye-catching coat. A mid-sized lemur; males and females are strikingly marked. Chestnut-brown patches on the chest and limbs “pop” against the white hair that covers the body. Bright, yellow eyes peer out from the hairless black face. Long, strong limbs and a long tail make their arboreal travel graceful, swift, and seemingly effortless. Hear that? It can be hard to hear a sifaka unless it is threatened. Coquerel’s sifakas have a limited collection of vocal calls. They are most commonly heard quietly humming, though they give off loud sounds of alarm when startled. Loud aerial roars are directed at predatory birds, and the characteristic “Shi-fakh, shi-fakh, shi-fakh” is used to warn group members of danger. Safety in numbers. Life in the trees protects sifaka groups from the few predators that share their forest homes. Loud piercing alarm calls warn of danger. All members of a group may simultaneously produce the explosive, nasal, hiss-like call “Shi-fakh, shi-fakh, shi-fakh.” This distinctive call, made by all sifaka species, is what gives the lemur group its name. Range. Coquerel’s sifakas live on the island of Madagascar. These lemurs reside in small forest pockets in northwestern parts of the country in the Ankarafantsika Nature Reserve and the Bora Special Reserve. Both of these areas have been damaged by annual fires set by nearby farmers. Hunting of sifakas by locals might occur in some areas, although in many parts of its range it is protected by taboo or fady. Coquerel’s sifakas are most at home in the tops of trees where they can often be found feeding, playing, or sleeping. They gracefully leap across large distances to move from tree to tree. Though these animals spend much of their time in the forest canopy, they are also comfortable on the ground. Here they hop, like kangaroos, bounding off their back feet with arms raised high in the air. More leaves, please! 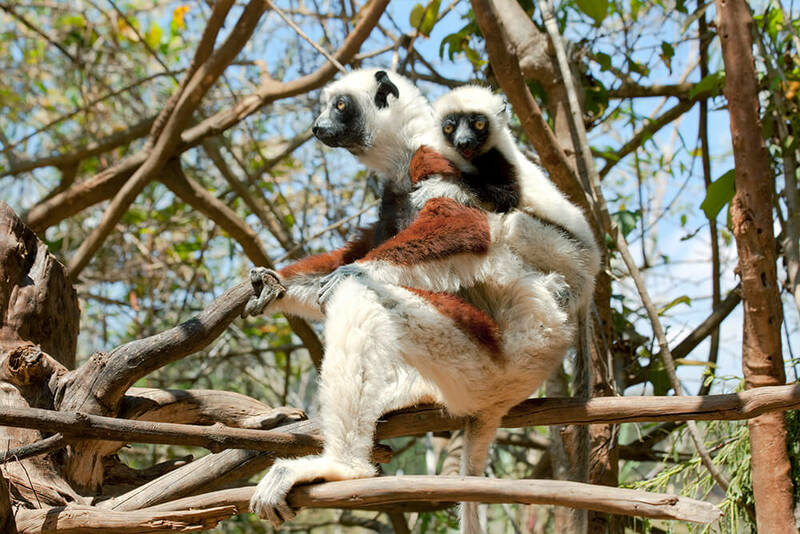 Leaves make up most of this sifaka's diet, though they also eat flowers, fruit, bark, and dead wood. In zoos, vegetables such as carrot, sweet potato, onion, and corn are also on the menu. Individuals lie on, sit on, or hang from branches when eating their meal. Good morning! Coquerel’s sifakas begin their daily activities near sunrise. They often soak up the morning sun, basking in the treetops with their arms stretched out before heading to find food. Small groups of males, females, and young move slowly through the trees in search of food. They may travel up to a mile before the end of their daily trek, which generally occurs before sunset. Life in the trees protects sifaka groups from the few predators that share their forest homes. Loud piercing alarm calls warn of danger. All members of a group may simultaneously produce the explosive, nasal, hiss-like call “Shi-fakh, shi-fakh, shi-fakh.” This distinctive call, made by all sifaka species, is what gives the lemur group its name. Family affair. Sifakas live in small, social groups of males and females numbering 3 to 10 individuals of varying ages. Aside from mothers and their offspring, group members are not necessarily related to one another. Members sleep and forage together; they even share territory with other nearby groups. Females may mate with males outside of their immediate group. Males often roam around for long distances to find mates from multiple groups. Many “child care” duties are shared between group members. Infants ride on the back of mom or other group members, as they travel to find food. Between three and four months of age the infants’ are capable of moving about on their own, and mothers give them a helpful nip to encourage their independence. Youngsters become sexually mature around the age of 3.5 years. The oldest captive-raised individuals lived to age 30. Coquerel's sifakas can now be seen at the Zoo's Conrad Prebys Africa Rocks exhibit, along with blue-eyed black, red ruffed, red-collared, and ring-tailed lemurs. Loss of habitat is the main reason for declining population sizes in Coquerel’s sifakas. Unfortunately, little is known about actual numbers in the wild. Historical information on population size is lacking, though known population declines and decreases in available habitat occurring within recent generations lead many to suspect a population decline of 50 percent within the past five decades. 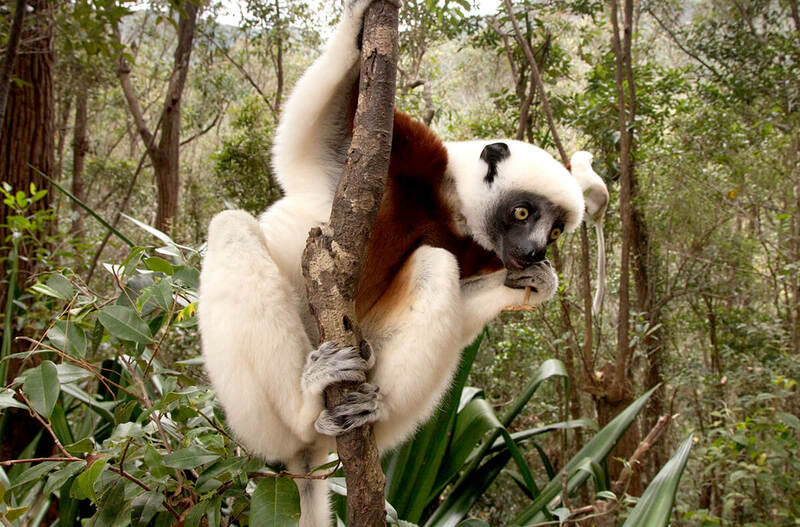 Safeguarding of populations within existing protected areas and community-based conservation actions are needed to help ensure the sifaka’s (and other prosimians') continued survival. In Malagasy culture, sifakas are often viewed as “sacred sun worshippers.” This traditional view very likely stems from the animals’ curious habit of basking in the early morning sun before heading out to forage for food. Leaping lemurs! Whether through the trees or on the ground, these sifakas can jump. They can easily fly across open expanses of nearly 40 feet (12.2 meters) to move from one tree to another. On the ground they “dance,” hopping in a kangaroo-like fashion. Toothcomb? 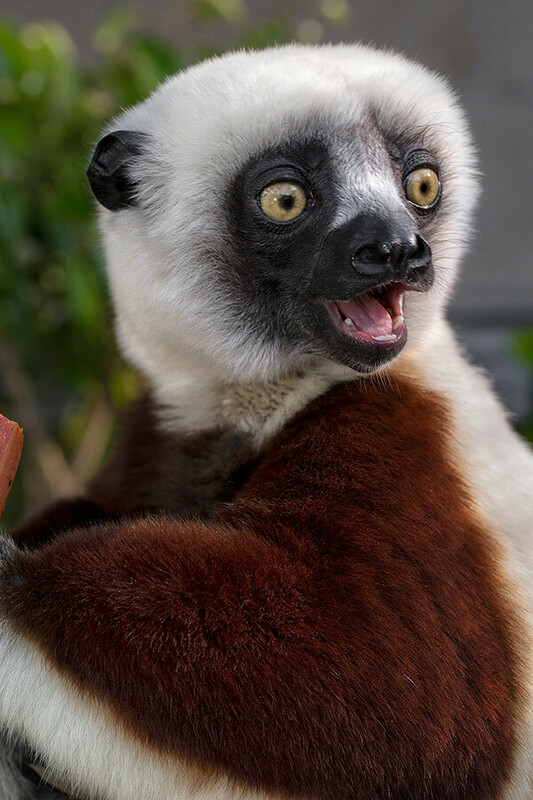 Sifakas, like many other lemurs, have modified lower incisors specialized for grooming. Tall, slender, and evenly spaced, these teeth help to comb and clean the hair. Resting individuals are commonly seen licking and combing one another’s hair. Group members huddle together on cold nights. Individuals sit single-file along a branch, to help retain heat. Some have described the sight as appearing similar to people on a toboggan.